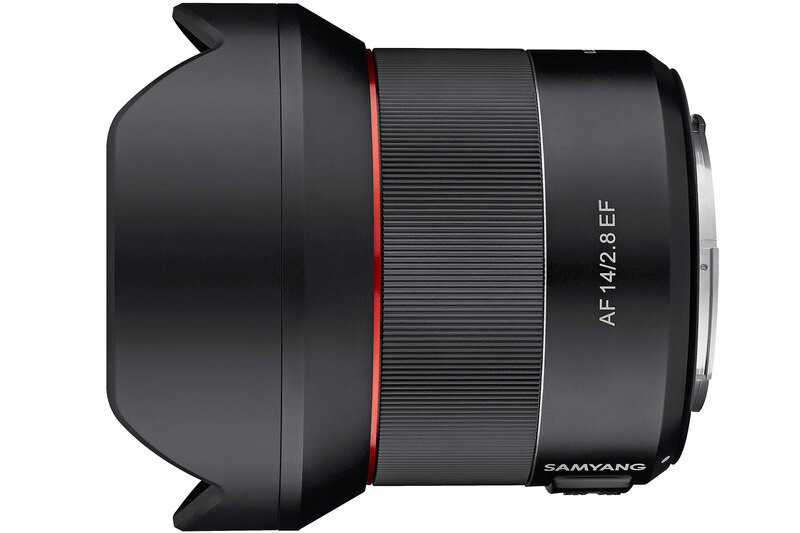 Samyang has announced its first autofocus lens for DSLR cameras, in the shape of the of the AF 14mm F2.8 EF. Designed for use on full-frame Canon models, it can also be used on APS-C cameras, with a field of view equivalent to a 21mm lens on full-frame. It’s due to go on sale in February, with a suggested retail price of £649. Despite its near-identical name to the existing Samyang AF 14mm F2.8 FE for full-frame Sony mirrorless cameras, this latest model is necessarily an entirely different design, due to the need to accommodate the additional lens – sensor spacing imposed by the SLR mirrorbox. 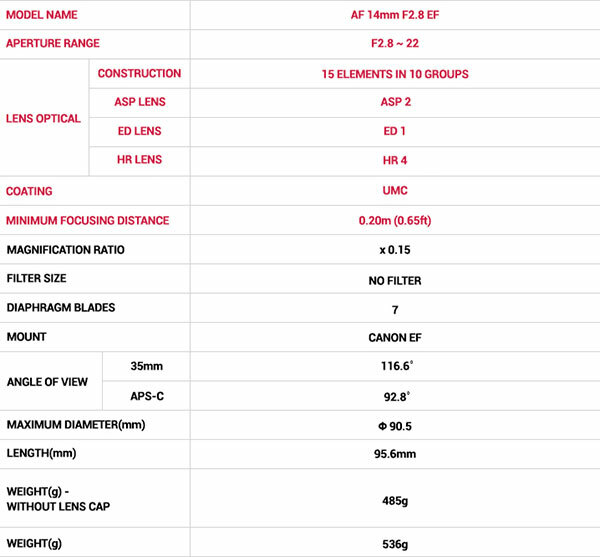 Its optical formula employs 15 elements in 10 groups, including 2 aspherical elements, 4 high-refractive (HR) elements and 1 extra-low dispersion (ED) glass element to minimise distortion and chromatic aberration. This also marks it out as distinct from the manual-focus Samyang 14mm F2.8 IF ED MC Aspherical for DSLRs, which employs a 14-element construction. In terms of physical design, the new optic appears to be fairly typical of its type, with a bulbous front element protected by a large petal-type hood, and no filter thread. Cosmetically it uses a similar minimalist approach to Samyang’s AF lenses for Sony E-mount, with a plain black barrel and a finely-ridged manual-focus ring that has a metallic red accent in front, and a silver one behind. One notable difference is the addition of a focus-mode switch on the side of the barrel. Samyang says the lens is weather-sealed, which should be welcome news to landscape photographers. Weighing in at 485g it’s somewhat lighter than its closest equivalent, the Canon EF 14mm f/2.8L II USM; it’s also a third of the price. As yet there’s no word on the lens becoming available in other mounts, but it seems logical that a Nikon F version should follow sooner rather than later. January 8th 2018, Seoul, South Korea. 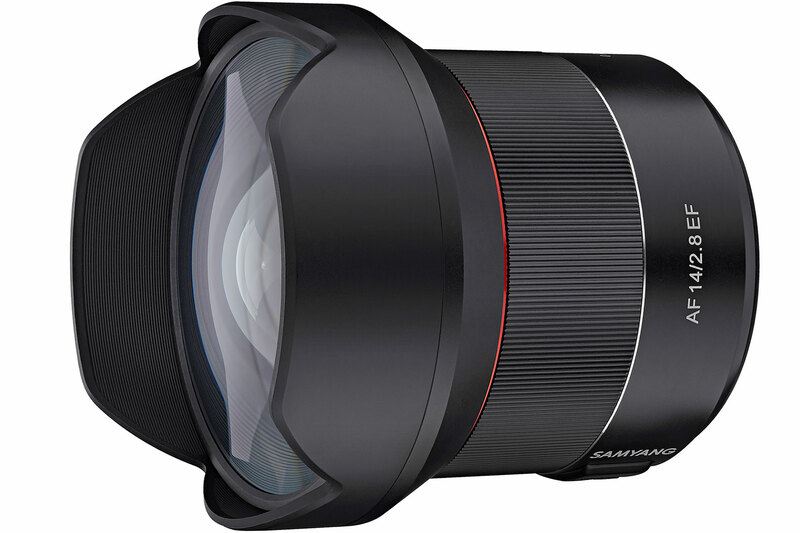 Samyang Optics is pleased to announce their first autofocus lens for Canon full frame DSLR cameras: AF 14mm F2.8 EF. This lightweight wide-angle lens inherits the renowned image quality of Samyang’s wide-angle series and delivers a quiet, fast and accurate autofocus system. This first EF mount autofocus lens from Samyang encapsulates the brand’s universally respected optical technology, especially in the wide-angle lens category. The optical construction features a total of 15 lenses in 10 groups that include 7 special optic lenses to maximise image quality. The 7 optic lenses consist of 2 aspherical lenses, 4 high-refractive lenses and 1 extra-low dispersion lens, which helps minimise distortion and various aberrations while producing crystal clear resolution. The even image quality from centre to corner of the 116.6 degree wide angle of view appears distinctly on its MTF chart.